At the base this tower has a length of about 6 in, a width of about 6 in and has a height of about 8 in. Cashews, Pecans, Almonds, Hazelnuts, Macadamia, Brazil Nuts, Pistachios, Peanut Oil, salt. My friends love your nuts! My mother was very pleased with the nuts...this was the perfect Birthday Gift. Smaller than I envisioned but that may be my fault although I did think there would be more nuts. Nice boxes. 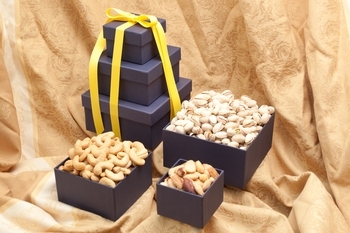 Did not taste the nuts as they were a gift but they seemed to be packaged well so I hope they were fresh.